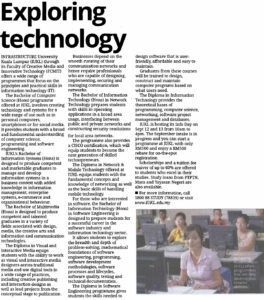 INFRASTRUCTURE University Kuala Lumpur (IUKL) through its Faculty of Creative Media and Innovative Technology (FCMIT) offers a wide range of programmes that focus on the principles and practical skills in information technology (IT). 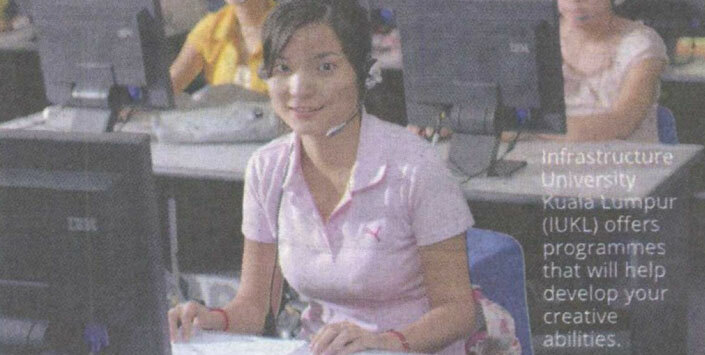 The Bachelor of Computer Science (Hons) programme offered at IUKL involves creating technology and systems for a wide range of use such as in personal computers, smartphones or for social media. It provides students with a broad and fundamental understanding of computer science, programming and software engineering. IUKL’s Bachelor of Information Systems (Hons) is designed to produce competent and marketable graduates to manage and develop information systems in a business context with added knowledge in information management, enterprise systems, ecommerce and organizational behavior. The Bachelor of Multimedia (Hons) is designed to produce competent and talented graduates in a variety of fields associated with design, media, the creative arts and information and communication technologies. The Diploma in Visual and Interactive Media equips students with the ability to work as visual and interactive media designers across traditional media and use digital tools in a wide range of practices, including creative publishing and interaction designs as well as lead projects from the conceptual stage to publication. Businesses depend on the smooth running of their communication networks and hence require professionals who are capable of designing, implementing, securing and managing communication networks. The Bachelor of Information Technology (Hons) in Network Technology prepares students with skills in operating applications in a broad area usage, interfacing between public and private networks and constructing security resolutions for local area networks. The programme also provides a CISCO certification, which will equip students to become the next generation of skilled technopreneurs. The Diploma in Network & Mobile Technology offered at IUKL equips students with the fundamental concepts and knowledge of networking as well as the basic skills of handling mobile technology. 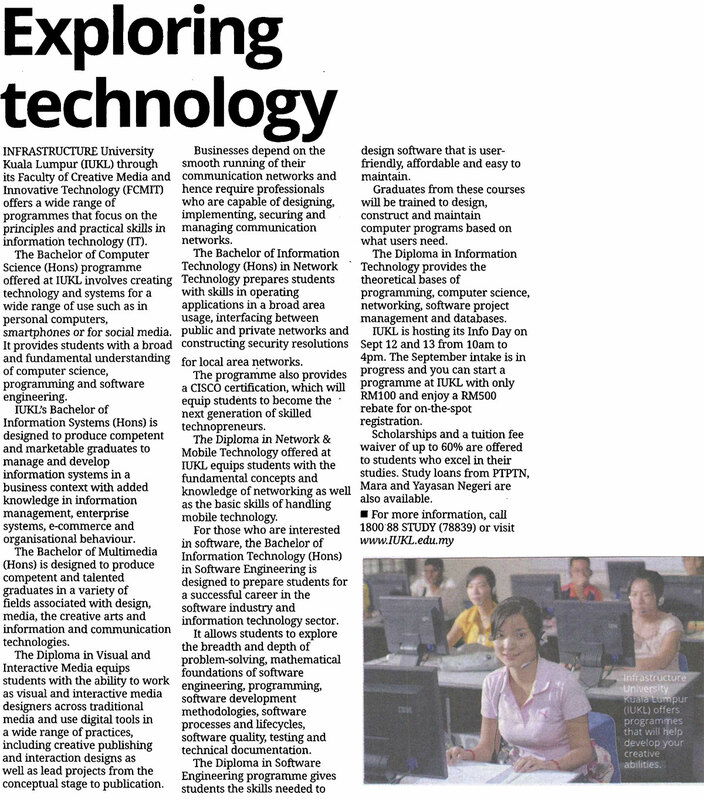 For those who are interested in software, the Bachelor of Information Technology (Hons) in Software Engineering is designed to prepare students for a successful career in the software industry and information technology sector. It allows students to explore the breadth and depth of problem solving, mathematical foundations of software engineering, programming, software development methodologies, software processes and lifecycles, software quality, testing and technical documentation. The Diploma in Software Engineering programme gives students the skills needed to design software that is userfriendly, affordable and easy to maintain. Graduates from these courses will be trained to design, construct and maintain computer programs based on what users need. The Diploma in Information Technology provides the theoretical bases of programming, computer science, networking, software project management and databases. IUKL is hosting its Info Day on Sept 12 and 13 from 10am to 4pm. The September intake is in progress and you can start a programme at IUKL with only RM100 and enjoy a RM500 rebate for on the spot registration. Scholarships and a tuition fee waiver of up to 60% are offered to students who excel in their studies. Study loans from PTPTN, Mara and Yayasan Negeri are also available.